Helping the environment one robot at a time!! 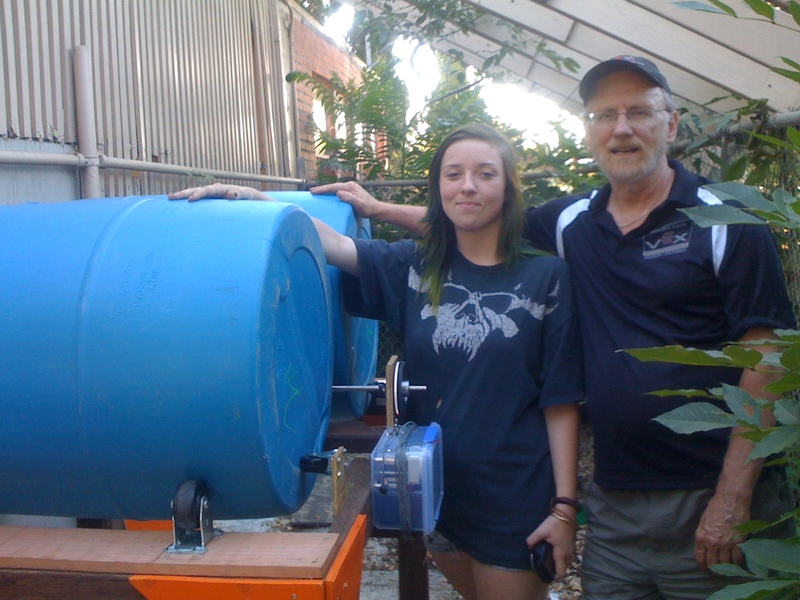 Thursday, I turned over our working dual 55 gal drum solar robotic composter to Bettina , a volunteer gardener in the Grant High School Serenity Garden. The garden has been in the news over the years but has run down considerably. Thanks to volunteer Master Gardeners and the Tree people, it is undergoing a transformation back to its former glory. The kids on the Grant Vex team 1508 (Lancer Bots) coached by Mujtaba Khan worked hard this spring to complete the project before school was out. The project was funded by a $1000 IEEE grant obtained through ARC foundation but we only spent about 60%. ARC Grant representative Wendy Castellanos has been our biggest supporter and we owe her a big Hug. The project was conceived by Roots and Shoots school environmental club and led by Beth Davis, a member of both clubs. Shown below are Beth and I with the first photo of the near finished product. Beth is on her way to UC Santa Cruz in the Fall. I will miss her great spirit. The Vex team was given the job of design and construction. 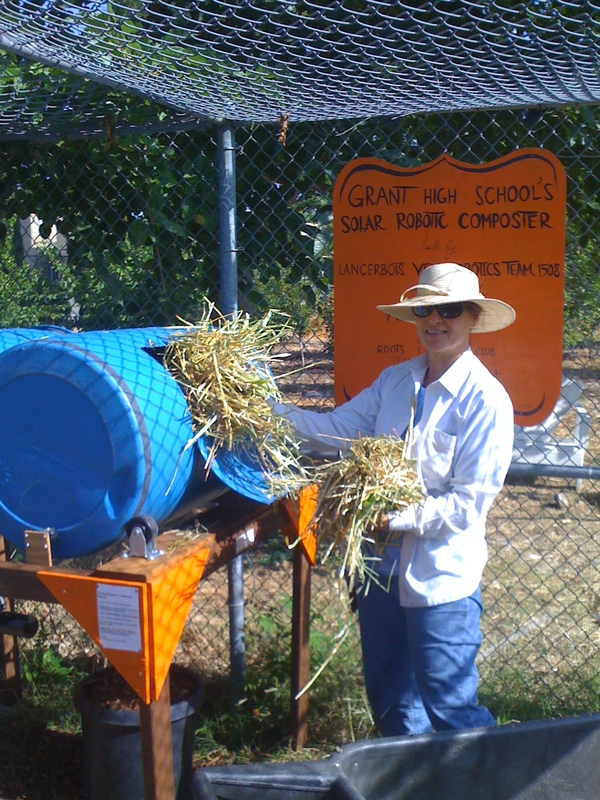 They didn’t quite finish before the end of the school year, so Beth and Ramin Khajeh spent a few days this summer with me completing the adjustments to handle the weight of the compost that was dimpling the 55 gal drums and install the solar panel. The main difference from this photo is that the support and drive wheels were moved outward toward the rim to give more structural support. The composter has a programmable timer that switches relays on to drive the motor for 2 minutes per day which in turn rotates the barrels about 5 rotations. Rotating the barrels aerates them and the composting time is considerably shortened (about a month). The barrels are held on a 2×4 treated lumber frame. The drive train consists of a 1/2 inch stainless steel axle with two 4 in drive wheels. The axle is driven with a cog belt pulley system that provides a 4.5:1 gearing to a Taigene van door motor (I borrowed/stole this from my 599 team FRC kit). It is held in place by four plastic self_aligning flange bearings donated by Igis. The electronics/motor are powered by a 5 AmpHr battery that is recharged by a 8 watt solar panel through a charge regulator. The solar panel is from an old highway call box. It has a Ioc = .5 amps and a Voc of 21 v.
The motor draws about 8 amps while rotating. It is designed to operate at 10 amps. The electronics are housed in a water proof box. A special thanks to Ramin for extra effort put forth over the summer. He is on his way to UC Berkeley (my alma mater) after graduating as class valedictorian. He too leaves a big void for the team to fill. Sad to say, the only Vex parts used were a few nuts , bolts and aluminum beams. 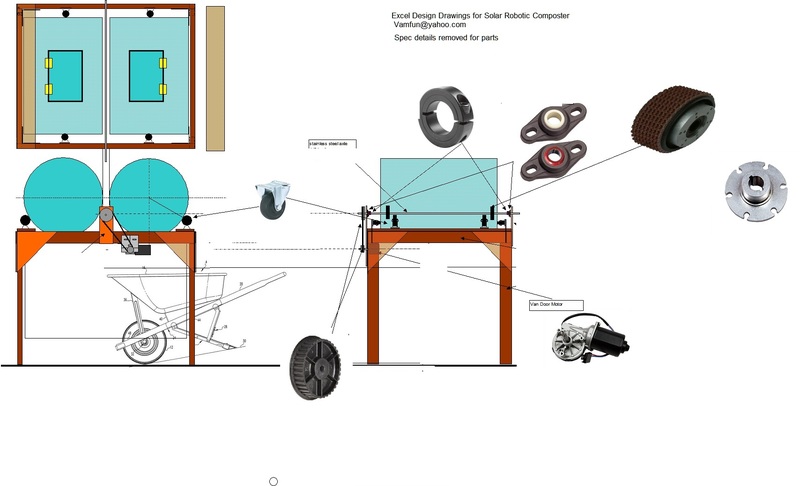 3/27/2013 Posted mentor design notes here: This is an excel program that contains detailed mechanical/electrical requirements analysis plus dimensions and materials used. Also included is a tab on electronic circuitry. Please ask permission to use designs. Photos of the team during construction here:https://www.dropbox.com/sh/n2qru9jymvz2urb/5Je6W1eNHB/Grant%202012%20Compost%20Project. These give you a better look at the in- progress assembly. I think this is a first! This entry was posted on Saturday, July 28th, 2012 at 12:42 am and is filed under FRC, Going Green, Vex. You can follow any responses to this entry through the RSS 2.0 feed. You can leave a response, or trackback from your own site. Hello. My name is Spencer Jackson, and I am a junior at Manteca High School. Our school recently got a new program, called Environmental Science. My project is to build a solar-powered composter. Is it possible that you have plans, for I saw your video, and I absolutely loved the idea. If you do, may I use them? Requesting permission to use the design for a backyard garden. Thanks for the heads up… see the mentor notes for electronics circuitry. Dear Chris, I just sent you a request to purchase the detailed plans so we can use this design on our family farm. The message was sent to your vamfun@yahoo.com account. We might even like to purchase the electronic box and control panel fully built if your students are willing to put it together for us. We will compensate them to do this. It shortens our cycle time in assembly.